ChemCon Conferences (“ChemCon”) is committed to respecting and protecting your privacy. Visitors may access the ChemCon website while remaining anonymous and without revealing any personal information (except as referred to below under “Cookies”). Occasionally, and in order to provide relevant, desired information concerning products or services, ChemCon may request personal information from you. Contact the ChemCon Privacy and Data Protection Office via office@chemcon.net. ChemCon maintains all personal information as private to the best of the company’s ability. However, personal information may be disclosed under the limited circumstances described below, and by submitting your personal information, you agree that ChemCon may do so. To participate in certain activities and to obtain certain services offered on our website, you will be asked to provide varying amounts of personal information. In addition to the information you provide, ChemCon may also collect information during your visit to a ChemCon website through our automatic data collection tools, which may include Web beacons, cookies, embedded web links, and other commonly used information-gathering tools. These tools collect certain standard information that your browser sends to our website such as your browser type and language, access times, and the address of the website from which you arrived at a ChemCon website. They may also collect information about your Internet Protocol (IP) address, clickstream behavior (i.e. the pages you view, the links you click, and other actions you take in connection with ChemCon websites) and product information. ChemCon may also use some of these automatic data collection tools in connection with certain emails sent from ChemCon and therefore may collect information using these tools when you open the email or click on a link contained in the email. ChemCon uses your personal information to better meet individual needs, to respond to specific requests for information, to send product specifications, and to make you aware of new or similar products or services in which you might be interested. ChemCon reserves the right to call or send registrants email communications from time to time regarding product, services and company updates, technical or administrative issues, legal notices or important information considered valuable or essential to you. ChemCon does not intentionally send unsolicited emails to anyone who has requested that ChemCon not contact them. When you provide personally identifiable information through a form on a ChemCon website, you have the option to opt-in to receiving communication from ChemCon. If you opt-in and change your mind at any time, you may tell the company that you do not wish to receive these messages by sending an email at office@chemcon.net or by following the “unsubscribe” instructions at the bottom of any email newsletter you receive. ChemCon does share non-personal, non-individual information from which individuals cannot be identified and which do not relate to individuals in aggregate form with third parties for business purposes, such as consultants and advisors to the company. Any company that ChemCon shares personally identifiable information with will have executed a confidentiality agreement, requiring that they keep all data received confidential. ChemCon shares information with trusted agents who provide specific services you have requested and/or administer information offered at the ChemCon website, for example, service providers who help manage, track and respond to customer inquiries, information requests, etc. ChemCon may also share information with authorized resellers, licensees and integration partners, who may be better suited to reply directly in response to your specific inquiries about ChemCon products and services. These parties do not use or otherwise disclose any information except as authorized agents for the purpose of providing the products and services that you have requested or administering the activities on ChemCon’s behalf, or participating in joint initiatives with ChemCon. ChemCon will disclose your personal information to a third party if required to do so by law or if, in good faith, ChemCon believes that such action is necessary to: (1) comply with the law or with legal process; (2) protect and defend the company’s rights and property or prevent fraud; (3) protect the company against abuse, misuse or unauthorized use of ChemCon’s products or services; or (4) protect the personal safety or property of personnel, users or the public (among other things, this means that if you provide false or deceptive registration information or attempt to pose as someone else, information about you including your computer’s IP address – may be disclosed to a third party (including the recipient of an email) as part of any type of investigation into your actions. The servers that operate the ChemCon website automatically identify a computer by its IP address. If ChemCon, in good faith, determines that you have used the service to menace, threaten, harass, intimidate or otherwise deceptively pose as another person, your actions will be investigated and your IP address may be disclosed to the recipient of any email, their legal counsel or representatives, and law enforcement officials as part of such an investigation. When you visit the website, ChemCon may place a “cookie” on your browser in order to improve your experience by recognizing you when you visit the website and in order to allow the company to optimize the information presented based on your demonstrated areas of interest. Cookies may also be used to compile information about website usage. This information can be used to enhance the content of the website and make your experience more informative. In addition, ChemCon employs certain advertising features enabled by Google Analytics in order to optimize the customer’s user experience on our website and provide you with the most relevant content. Google Analytics may collect data about our website traffic via Google advertising cookies and anonymous identifiers, in addition to data collected through a standard Google Analytics implementation. You may opt-out of the Google Analytics Advertising Features by reviewing your Ads Settings, Ad Settings for mobile apps, or by using the Google Analytics’ currently available opt-outs for the web available here. ChemCon may transfer its database, including personal information contained therein, to a third party who acquires all or substantially all of the assets of ChemCon whether by merger, acquisition, disinvestment reorganization or otherwise. ChemCon employs industry-standard data protection and information security procedures and processes to safeguard the confidentiality of users’ personal information. ChemCon, or partners and agents on behalf of ChemCon, do everything in their reasonable control to protect your information. Where one of ChemCon’s partners or agents has access to or maintains sensitive personal information, the company enters into confidentiality agreements in order to ensure the privacy of such user information priori to sharing that information. Internally, access to all users’ and registrants’ personally identifiable information is restricted to those employees who need access in order to fulfill their job responsibilities. Furthermore, ChemCon employees who deal with user information are kept up to date on various security and privacy practice issues as they arise. Finally, the servers for the website are stored in a physically secured, offsite facility. Beyond the physical security of your information, ChemCon also backs up servers regularly to prevent loss of data. While the goal is to safeguard personal information, ChemCon cannot ensure or warrant the security of any transmission and your information is submitted at your own risk. If at any point ChemCon decides to use personally identifiable information in a manner different from that stated at the time it was collected, ChemCon will notify users by way of an email to obtain their consent as a condition of doing so. You will still have the opportunity to elect not to have ChemCon use your information in this different manner. 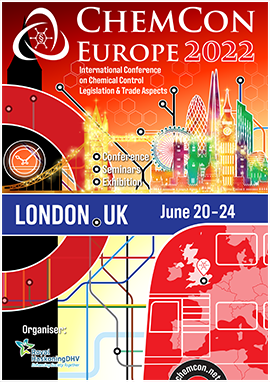 To modify the information you have provided during registration, please send an email to: office@chemcon.net. If you have a data privacy complaint, please contact us by email at: office@chemcon.net.